This week started off with a cold front from two days earlier lasting 4 days seeming to get worse each day. Even though this usually hurts fishing our guests got past the worst day, which was very windy with cold rain to have a great week fishing for all species. Ken Dlhy with sons Braden and Carter from Decorah, IA were fishing at Fireside Lodge for their 1st time. DOA the caught fish right away, Cater catching his very first Northern Pike and Braden catching his first Lake Trout. Second day was great, catching more Northern Pike and Braden caught his 1st ever Muskie being over 30-inches 3rd day was the worst day of a 4 day severe cold front bringing spitting cold rain and wind, however despite these adverse conditions they caught fish and made life memories with Carter catching his 1st ever Muskie and Braden landing a Monster Trophy Muskie measuring 46-inches. Wow! What a fishing day to be remembered. 4th day was a bit of a relaxing day catching some fish & finally enjoying the sunshine and not fighting the wind & rain. 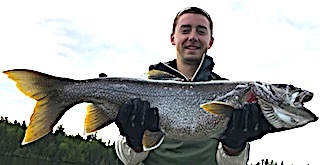 5th and final day was a great finish catching Pike and Braden came up with another BIG Fish catch landing a 33.5-inch HUGE Lake Trout giving him a great fight. All went home with great father and son memories to be remembered for a lifetime. Father Tom & sons Jim and Jeff from Palatine, IL returned with bells on for their 4th time. DOA was rainy cold front conditions but this could not deter these three as they left the dock smiling ear to ear all catching Northern Pike before suppertime. 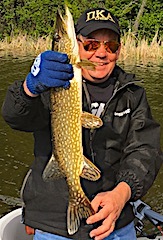 1st full day was a good day catching a lot of their favorite fish, Northern Pike, with Jeff landing the largest measuring 35-inches. 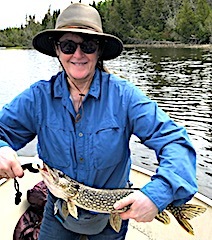 2nd day a good day catching bigger Pike and was filled with excitement when they spent 15 minutes viewing and Cow Moose with her two calves showing them the ropes of swimming and navigating the shoreline. They took plenty of pictures and video, and after this event said if they did not catch another fish it would be fine. 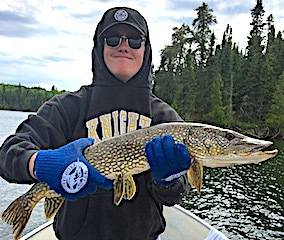 3rd and final day was a good finish all catching some nice Northern Pike up to 35-inches, despite the windy conditions, and they took their traditional picture at the dock. All left making some wonderful memories with Tom saying they will see us next year. Returning for their 2nd time was Mark & Tom Sweet, Tom Seitz, Ray Baldwin from Norwalk, OH and joining them for their 1st time were Dan Amborski and Ed Psurny from Bowling Green & Lewis Center, OH. DOA they got off to a fast start catching some Northern Pike and Dan caught a 34-inch Muskie. 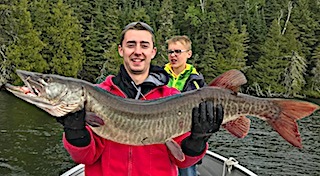 1st day was a bonanza fishing event as they all did excellent catching many Northern Pike 28 to 35-inches, 49 in just Mark & Ed’s boat plus Mark caught a 38-inch Muskie, 34-35-inch Lake Trout, Ed had a 33-inch Muskie, Tom Sweet caught a 38-inch Northern Pike, Dan Just missed a Muskie that both him and Tom S said would have filled the 48-inch cradle, and Ray caught a 27.5-inch 8 pound Walleye. Needless to say everyone was at the tackle shop before supper to re-supply on the hot lure, a suspending twitch bait. 2nd day Mark did the best catching another HUGE Lake Trout and hooked 4 big Muskie landing 3 in one day. 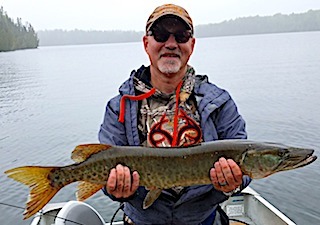 Dan while fishing with Mark also caught some larger size Northern Pike and Ed kept his Muskie a day going catching his 3rd. 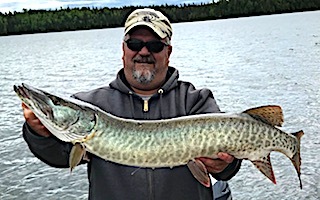 Third day had them catching 3 more Muskie as a group along with some Pike but they called it a day at 2:00PM to relieve themselves of the strong winds. 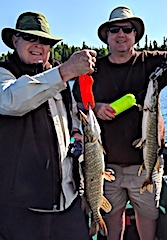 4th day Mark, Dan, and Ed portaged to a back lake getting fantastic Northern Pike action catching 260 between 9:00 am to 3:00 pm. 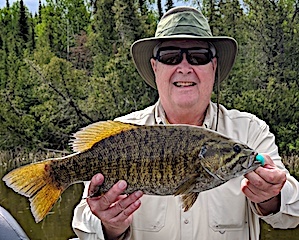 5th and Final day all had great fishing with Mark & Tom Seitz catching over 50 Northern Pike up to 36-inches, Ray & Ed had 27 with a good number over 30-inches plus Tom Sweet & Dan Smallmouth fished most of the day catching 47 BIG Smallies. 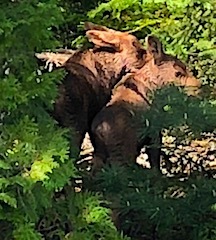 This sent them off on a high note until they return again for their traditional Canadian Wilderness Fishing Trip. 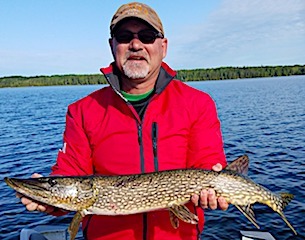 DOA they went right out and caught fish and Walt set the BIG Fish bar for the week landing a 41.5-inch Master Anglers Award Trophy Northern Pike. 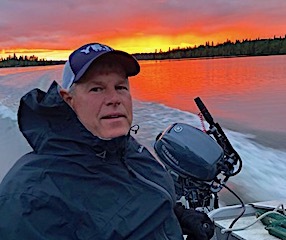 1st full day they faced very windy conditions but all caught fish, David landing a very nice Lake Trout, Walt caught a Trophy Smallmouth Bass, and all caught good size and plenty of Northern Pike. 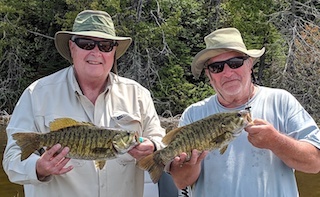 2nd day John & David caught some big Smallmouth Bass 17 to 18-inches and John had a Trophy at 18.75-inches plus they caught Northern Pike 33-35-inches. 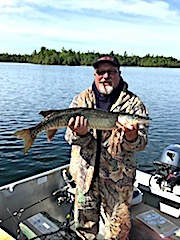 3rd day they were into the Pike catching over 30 in one boat, plus Walt landed a nice 37-inch Muskie, David caught a nice Lake Trout and lost a 40-inch plus Muskie. 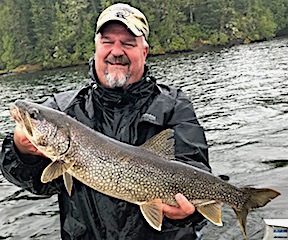 4th and final day was another great day Pike fishing landing some mid 30-inch fish and Walt caught a HUGE 33.5-inch Lake Trout. All had a wonderful fishing trip and hope to return next year. Don Johnson from Clermont, FL returned to Fireside Lodge to rediscover where he had spent summer family vacations from the age of 3-22. Returning with his son Jacob the excitement in their eyes was evident as Don reminisced about some of his experiences. 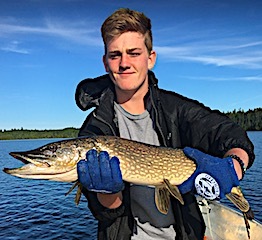 1st day was great catching Northern Pike, Jacob landing his first ever, and Don was so happy to show his son some of his favorite places he fished as a kid to young adulthood. 2nd day Don & Jacob had made arrangements to visit the cabin Don and his family would vacation at in his youth and after enjoying stepping back in time they went out and caught some nice Northern Pike. 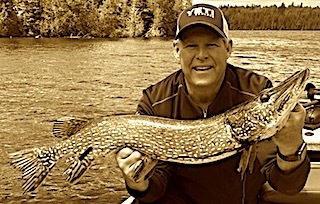 3rd day was a great day catching Northern Pike and Don landed a Lake Trout by surprise. 4th and final day was “absolutely fabulous” a quote from Don as him and Jacob enjoyed a perfect day on the water catching Northern Pike and when talking with Don at check out he said Jacob was bushed and had such a great time they will be returning next year, and hopefully with more family members to re-kindle their memories from years gone bye. 1st Time guests Robert Akers and Janelle Gagnler drove all the way from Oakland, CA to fish with us at Fireside Lodge. 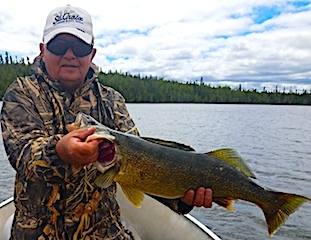 Robert has been waiting to test his fly fishing skills on our Little Vermilion Lake system for several years after following our weekly fishing reports. 1st after getting familiar he found a pink fly to be successful catching Smallmouth Bass. 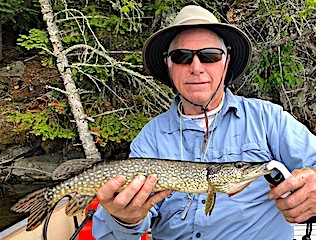 2nd day was very good catching both Northern Pike and Smallmouth Bass and Robert caught all his fish fly-fishing despite the windy conditions, and met his goal by landing his very first pike on the fly. 3rd and final day was off to a portage lake for their first time. Well they had a blast enjoying the nature walk through the bush and they had terrific fishing catching one Northern Pike after another and Robert went from never catching a Pike on the fly to catching over 30 Fly Fishing and lost about 40-plus Pike plus Janelle caught just as many with spinning gear. This was a great way to conclude their trip and we found Janelle that evening relaxing in the lodge to the point of almost falling a sleep. 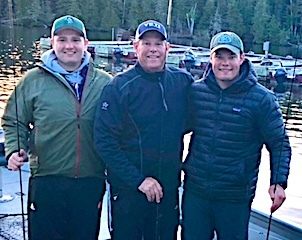 Long time return guests Doug Kerr with son Darin and great friend Greg Stowe all from Henrico, NC with thrilled to be back to hunt down BIG Smallmouth Bass. 1st day despite cold front conditions these three knocked it out of the park catching 79 Smallmouth Bass up to 18-inches. 2nd day was just as good a day as day one catching 78 Smallmouth Bass and 3 Northern Pike with Doug again being the top catcher, which entitled him to wear the award shirt for the 2nd day in a row. Every year Greg makes a special shirt, which is worn by the person catching the most fish each day. 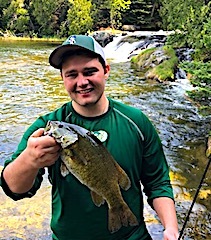 3rd day was a slower day comparatively but by most standards was a very good day fishing as they caught over 40 Smallmouth Bass and a few Pike and Doug still held on to his title retaining the special shirt. 4th day was amazing as they caught 130+ Smallmouth Bass all over 16-inches with most 17 to 19-inches and Doug still held on to his title. 5th day was almost a carbon copy of the 4th including Doug holding on to the most fish caught title, and for Greg & Darin there’s no catching up now. 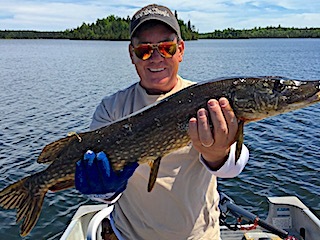 6th and final day they Pike fished until noon catching some nice size fish and Doug & Darin had a father son double. 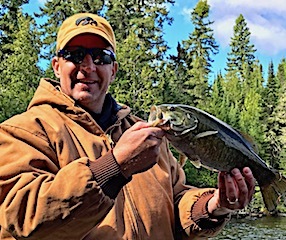 From noon to 2:30they caught 30+ Smallmouth and decided to conclude one of their most productive fishing trips ever and just kick back and enjoy the late afternoon and evening relaxing and enjoying the sunset.